Right now, I'm "working" on the Colonial Marines armor. I'm trying a scratch build with real world items but its slow going. I'm looking for detail plans, something to show the dimensions but not really a template. Thanks for providing a resource for people to contribute and work from. Hi, I'm just introducing myself. I'm a photographer with a passion for sci-fi movies including Aliens. As well as photography I make the occasional props and am working on a pilot helmet. All being well one of my images will have successfully displayed so you can see my work. I first watched Aliens when I was 7 or 8 and was pulled in. I have seen all the movies. I currently have the action figures from both Kenner and Neca. Thats amazing. I've recently just made a tail out of foam, but a full suit is a tad ambitious for me. Hello everyone, my name is Tony. I been a fan of the Aliens movies since I was a kid. I have both Kenner and Neca line of figures. I really want to start to cosplay. I was in the Army for 5 1/2 years. Just love everything Aliens. I am in the middle of putting a colonial Marines officer uniform together..
Heya everyone, my name is Erick from Phoenix, and Ive been a fan since I was a little kid...too little at (at the time) to understand Alien but I saw it...and then when Aliens came out that was pretty much my WORLD. 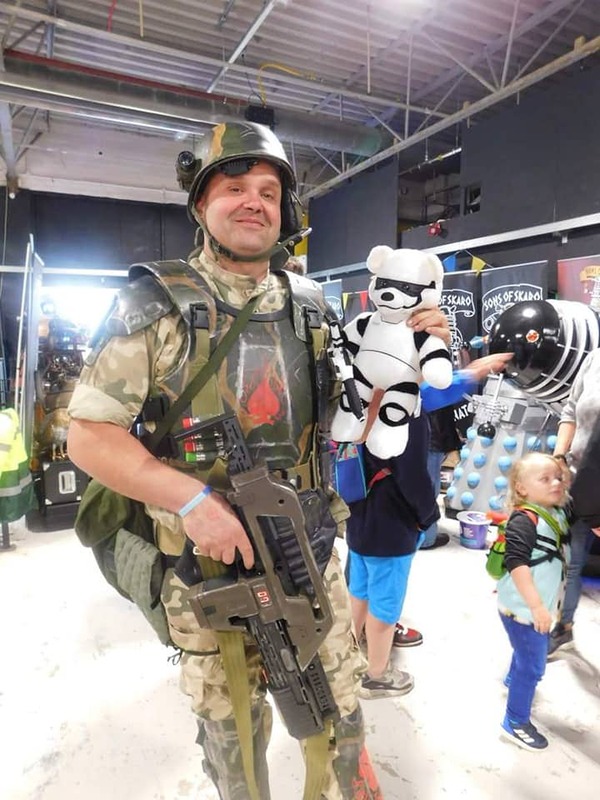 Been in love since, and am well entrenched in the hobby of cosplay (I have a mando merc, an NCR Ranger from Fallout, and a custom Sith) and even played in a fan film. Even though its been a dream of mine to don that awesome USCM armor, I had never gotten around to it for some reason or another, until now. Spatcave makes one of the best sets on the market and his price is reasonable for the amount of time his finished products save you on build times. Welcome to the crew. Check the drops for conventions in your area and if you find one in your area you are going to, please post so we can try to attend with you. We also have electronic files for our business cards and banners so you can get those printed if you want to ever do a fan table. Boreas here. Big fan of all things alien. Currently rewatching all the movies and can't help but want to see what's out there for alien costumes and cosplay as I'm really interested in that kind of stuff. Welcome! Join us @ Berlin Comic Con and talk to our Xeno Experts. Hi my name is ned and i have watched the first Alien thousands of times. Must be thousands, it's my default movie. I think Sigourney Weaver is a good candidate for cloning, I mean as Ripley its already happened, multiple times. I want to see blomkamp's Alien. Quite badly. Well see this the thing, I have no interest in costumes. Not meaning to be rude and I do indeed appreciate the invite, and will take you up on it, thankyou. I like the idea that forums are quiet these days, the net has become a bit loud. I like that this is an old forum, first post I can find is 2004. I'm a member of the Resident Evil Cosplay Group, alongside Shaun (Hellios_virus). I joined here to learn as much as I can to build/purchase/mod a pulse rifle. Aliens was the scariest movie experience for me when I was a kid. I love the sound of a blasting Pulse rifle! Nice rifle! What brand or custom? Turned out really nice. Do you have more pics of it posted anywhere? Welcome to the new batch! Friends call me reaper, been a fan for years, I am just standing by for an ID number. Let's kill some bugs.